The Upstate Medical University Department of Physical Therapy Education envisions communities in which the health of individuals is promoted by physical therapists who are committed to lifelong learning, service to others and the pursuit of professional excellence. 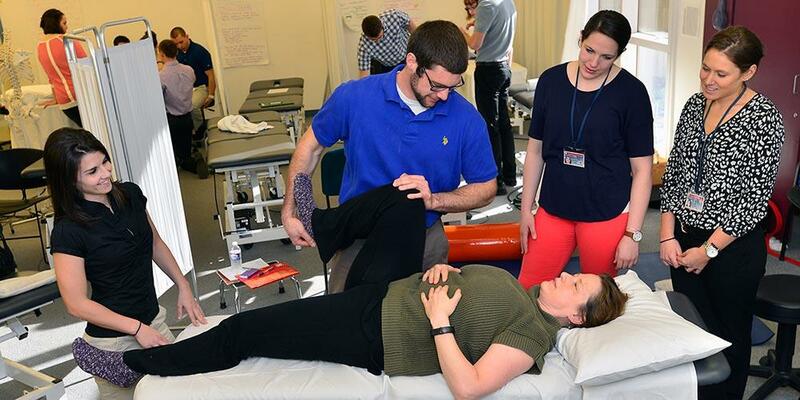 The Upstate Medical University Department of Physical Therapy Education uses innovative education, scholarship and service to inspire students and clinicians to be transformative physical therapy leaders. The Doctor of Physical Therapy program will prepare students to be generalist physical therapists who embrace best practice principles and professional core values, and who are prepared to meet the changing physical therapy needs of society. Students will achieve all requisite training to perform as entry level clinicians as measured by performance on the Clinical Performance Instrument (CPI)*, and all curricular assessments. A minimum of 90% of graduates will pass the licensure exam on the first attempt. Graduates seeking employment will be working in the field within 6 months of graduation. Students will successfully complete a patient case study reflecting critical thinking and problem solving. Students will successfully complete the capstone course, PHYT 651 Applied Clinical Decision Making. Employers and graduate surveys will reflect positive feedback regarding the critical thinking, lifelong learning, evidence-based practice, core values and generic abilities of graduates. The program has additional goals in the areas of scholarship and post-professional PT development but the professional education goal is fundamental to the work of the department. The Department of Physical Therapy Education promotes advancement of professional skills by offering post-professional programs that will enhance contemporary physical therapy practice. All faculty will maintain a scholarly agenda that progresses toward peer-reviewed dissemination (publication) of findings. Demonstrate effective communication skills with a variety of stakeholders. Communicate (verbally and non-verbally) in ways that are congruent with situational needs. Communicate effectively as members of an interprofessional healthcare team. Effectively document patient encounters based on legal, ethical and institutional principles and guidelines. Educate various stakeholders using relevant and effective teaching methods. Demonstrate professional, ethical, fiscally responsible and culturally competent practice. Demonstrate a commitment to society and the profession through advocacy, mentorship, education, service and prudent resource utilization. Adapt delivery of physical therapy services with consideration for patients’ differences, values, preferences, and needs. Participate in the financial management of physical therapy delivery consistent with regulatory, legal, and facility guidelines. Promote health and wellness, examine, evaluate, diagnose, establish prognosis, provide intervention(s) and manage physical therapy services for individuals with movement dysfunction. Promote and advance human health and wellness. Perform physical therapy patient examination using appropriate evidenced-based tests and measures. Evaluate data from the patient examination to make appropriate and prudent clinical judgments. Determine a diagnosis and prognosis that guides future, optimal patient management. Establish a physical therapy plan of care that is safe, effective, patient-centered, and evidence-based. Perform physical therapy interventions in a competent manner. Direct and supervise personnel to meet patient goals and expected outcomes according to legal standards and ethical guidelines. Critically evaluate and applies evidence as a basis for PT practice, determines the effectiveness of intervention(s), and demonstrates a commitment to life-long learning. Participate in self-assessment to improve clinical and professional performance. Apply current knowledge, theory, clinical judgment, and the patient’s values and perspective in patient management. Last Modified: September 18, 2018. Contact Anne Starowicz with questions about the content of this page.